We had a wonderful day yesterday. Justine is over from Brisbane and came to hang out for a few hours with her beautiful kids Jessica and Sarah. Sarah is 3 weeks older than Kien and Jessica is three. We got all three of them to do tummy time together. Sarah was only interested in munching on her hand. Something remarkable happened yesterday. I was busy expressing and Kien was making his tired sounds. So Justine wrapped him up, put the pacifier in his mouth, put him in his cot, patted his chest for a couple of minutes and then left the room while he was wide awake. I went in to check on him 5 minutes later and he was fast asleep. Wow! I am so proud of him, and proud of myself. I have taught my son how to sleep. But it took for someone else to show me he was able to fall asleep on his own without me hovering all over him. Looks like Kien has found himself a hot babe to roll around with :-) what a cute picture the tummy time one is. Good on you for all your hard work getting his sleeping habits to change. Wow what neck control! He's so strong! 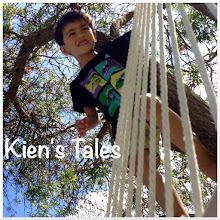 I just remembered about this blog, what great reading and I love these photos of our kids.